It has been very difficult to cut through the understandable distractions provided by the recent passing of Steve Jobs to analyze the product Apple launched last week, the iPhone 4S. When the device hits stores tomorrow it will probably be the least scrutinized new product Apple has launched in years, however there is one new element you will find in the new iPhone which might be seen in retrospect as the feature which brings body area network technologies to American consumers by Christmas 2011- Bluetooth 4.0. Apple has been the first consumer device maker to begin embedding Bluetooth 4.0 in their products, starting with the MacBook Air and Mac Mini in July. By embedding Bluetooth 4.0 in their devices first, Apple has forced their competitors to follow their lead and integrate the technology into the next generation of Smartphone. More importantly, Apple has created a viable consumer base for developers of applications in the largely unexplored realm of body computing and wearable sensor networks. IMS Research predicts the decision by Apple to pioneer BLE in their iPhone 4S device should be a huge stimulus for developers of emerging mobile health devices incorporating low energy technology. They anticipate the shipment of greater than 370 million units by the end of 2012, and 1.6 billion by 2015. It is anticipated wireless medical applications will be the most attractive opportunity for realizing the value of the new low energy protocol. Several companies have already developed Bluetooth Low Energy chip sets including Broadcom, CSR, Texas Instruments, and Nordic Semiconductor among others. The first Bluetooth 4.0 heart rate monitor, developed using a Nordic Semiconductor chip set, was announced this past June (pictured below). 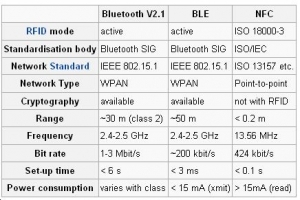 Bluetooth 4.0 enabled devices are backwards compatible, thus BLE will not be replacing the existing Bluetooth protocol used for most wireless interaction on mobile devices for higher latency activity. Instead the chip set includes “Closed Bluetooth”, “Bluetooth Highspeed”, and “Bluetooth Low Energy” in one unified stack. High speed mode is based on Wi-Fi, while the classic mode supports legacy protocols, ensuring all existing Bluetooth enabled devices will work seamlessly with the new low energy technology. The advantages of the new standard become clear when you compare BLE head-to-head with other personal area network communications technologies. BLE has big advantages over Near Field Communication (NFC), which is presently one of the leading low-powered wireless communication technologies on the market, the largest being range of the technologies, NFC (0.2 meters) and BLE (50 meters). For the first time the medical community has good reason to believe the body computing future we have speculated and analyzed might be finally upon us. Please take this as constructive criticism. This article is misleading. “Bluetooth 4.0 enabled devices are backwards compatible” is completely false. It is very important to be clear on this. 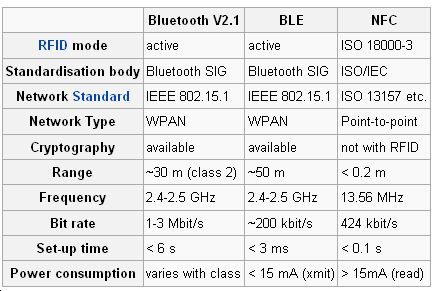 There are two new types of bluetooth. “Smart Ready” for hubs and “Smart” for sensors. Smart Ready is backwards compatible. Smart is not, and will only work with smart ready devicess or those explicitly designed to work with them. This is critical to consider this when making decisions. Please bear this in mind. it took me hours to figure that out, becuase the info is not clearly given. it’s an interesting article, thank you. I would suggest that an in-depth comparison would be made between BT 4.0 and the ANT+ standard. ANT+ has been around for some time, but from a consumer perspective there’s very little information on what it is, why it exists, roadmap, etc.